Having a lush green lawn is a goal of proud homeowners everywhere and the summer is the perfect time to show it off. If you want to host get-togethers and barbeques outside you can’t deny it’s a lot nicer to look out at a green healthy lawn instead of a dry yellow wasteland. It takes some work to get a lawn looking nice and presentable, and a major attribute to grass you can be proud of is the fertilizer you use on it. When it comes to fertilizing, there are many things that influence the outcome of your lawn’s success and healthy life. First, we need to understand the point of fertilizer and why it’s so important to apply. Your lawn absorbs nutrients that are naturally found in the soil but overtime becomes diminished as the grass uses up everything that’s available. This is why we give our grass all the good stuff its missing out on to make it happy and healthy all year. Using fertilizer strengthens your grass and gives it the upper hand against common diseases and droughts. Making sure you apply fertilizer in the first place is a no-brainer, however, there’s more that goes into the process than you may have originally thought. 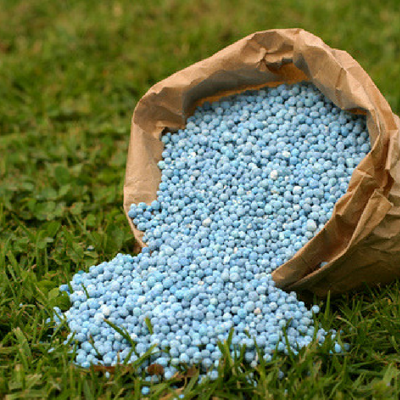 Know the facts and make the right decisions when applying fertilizer to your lawn. When buying your own fertilizer it could be intimidating to pick the right stuff. With so many different bags with numbers, ingredients, and ratios it could be overwhelming. It’s good to know that most fertilizers are made up of three common nutrients. The first is nitrogen, which stimulates leaf growth by increasing the production of chlorophyll a main component of photosynthesis. Next is potassium, which helps to strengthen your grass and defend against disease and drought. Finally, there is usually phosphorus in the mix, this gives development to the roots and stems of the grass in your lawn. Different lawns require different combinations of the three nutrients and using the wrong stuff could actually kill your grass and even encourage weeds and disease. This is why you should always test your soil when choosing a fertilizer. You should think of testing your soil as a check-up on your lawn. By understanding what nutrients it has and is lacking you can make a better judgment on the right kind of fertilizer to feed the grass. On top of testing for the three ingredients we discussed earlier, you should also test the pH level of your soil. Majority of healthy lawns in the US enjoy a pH level of around 6.5-7. If the pH level is off to begin with your fertilizer may not work as well as it should, if it even works at all. Typically if a pH level is low you may need to add lime, if it’s at a high level you could add sulfur. Sometimes people make the mistake of applying too much fertilizer to their lawn. By doing this they could burn the roots of their grass and make it even more susceptible to damage by insects and diseases. You can often notice if you over-fertilized by seeing brown spots and patchy areas. If you believe that you made this mistake you should water, water, and water some more to make sure you flush out the soil as best as possible. Even if you’ve picked out the perfect kind of fertilizer it could be not worth it if your timing is off. Different grass types have different uptake curves where they will take in the optimum amount for a healthy season. 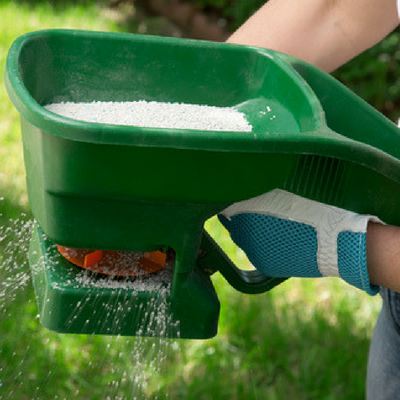 A good time to fertilize your grass for the first time is around the same time you would normally cut it at the beginning of the spring. You should apply again in the late spring around 6-8 weeks later to make sure the lawn is nourished and not going hungry for the summer. The summer is the hardest time on your lawn with scorching heat, foot traffic, and all the bugs. It’s a good idea to treat your lawn for a third time during mid-summer to give it the nourishment it needs to stay strong during it’s roughest season. Many people recommend giving your lawn a final treatment in the fall. This will help it repair itself from the beating it took all summer while also giving it nitrogen to store up for its long winter nap. Need your lawn fertilized? Contact our own lawn care professionals today at Naturally Green Lawn Care to take care of it for you!